February marked 200 years since Edgar Allen Poe's birth. 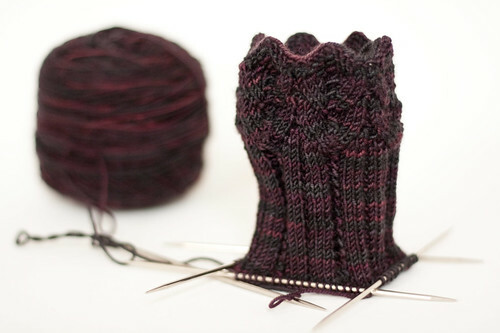 Seemed fitting to knit the Lenore socks in the Lenore Socks that Rock colourway, right? 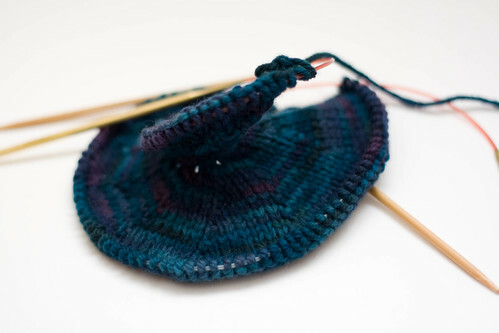 I cast on just after Poe's birthday and finished the first sock two weeks later. The other is still mid-cuff, but it's in my purse and gets picked up from time to time. 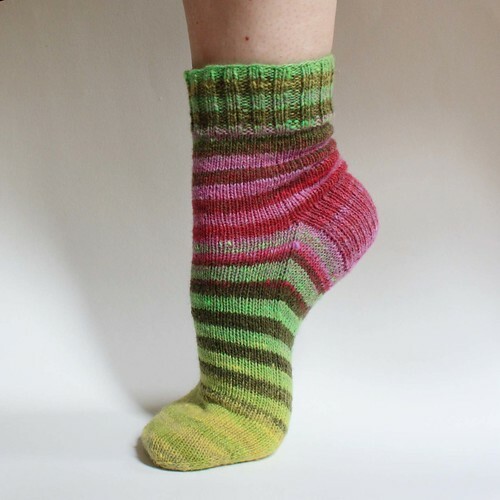 With a few knitterly gatherings coming up on the schedule, I'm sure I'll get the second sock knocked out by say, oh, next February. Well, JulieFrick does and I'm not one to tell her no. The Husband and I are taking some much needed time off this week. After a hectic summer we're heading to Minneapolis to visit some pals and kick back for a few days. (I never thought I'd vacation in Minnesota, but at least it won't be as cold as the last time I was there.) As always, the tricky part of travelling is deciding what knitting to take. Ms. SotoSofties and I went to Windsor Button on a yarn mission yesterday and I picked up a couple things to make the decision that much tougher. Do I take the fiddly Garden Snail that I started? 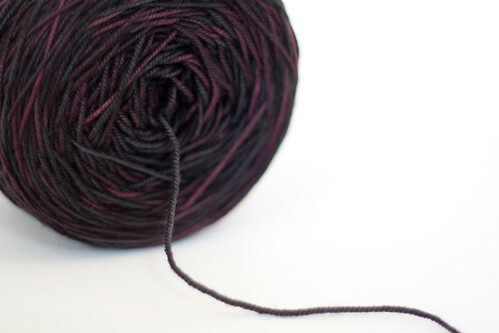 Do I start in on a pair of colourwork mittens in my favourite colour combo of the day? 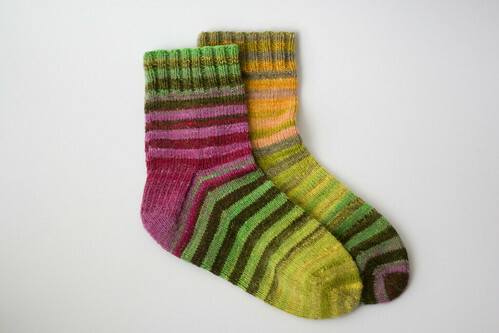 Continue the second of the Noro striped socks? 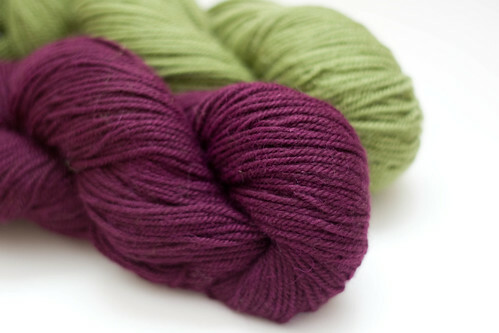 Or chuck all the gift knitting and work on a mini-Hanami Sea Silk scarf for myself? Think I can juggle the beaded cast-on on the plane? 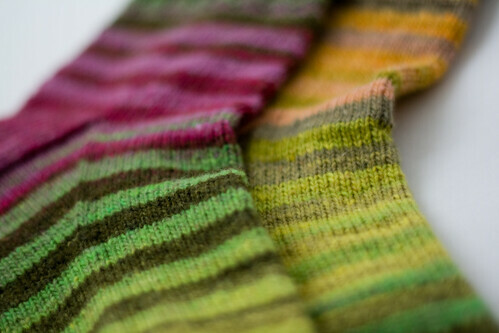 I've finished the first Noro Striped Sock. 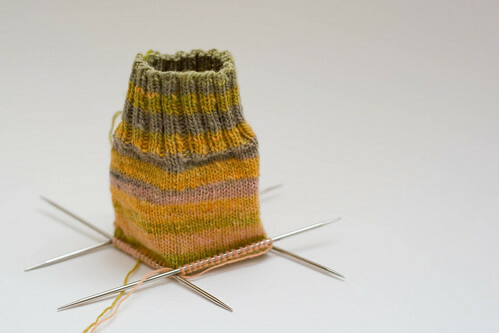 It really isn't that momentous until I consider that I haven't finished a sock since last September. 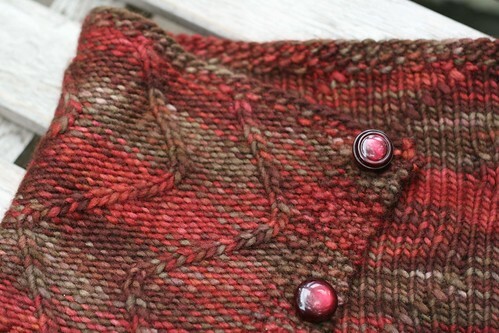 By the time the second is off the needles, it will have been a year. A year! 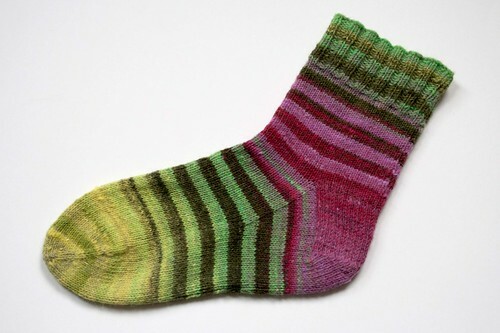 I've started a few socks over the months, but none have them were working for me. Every single one, riiiiip. 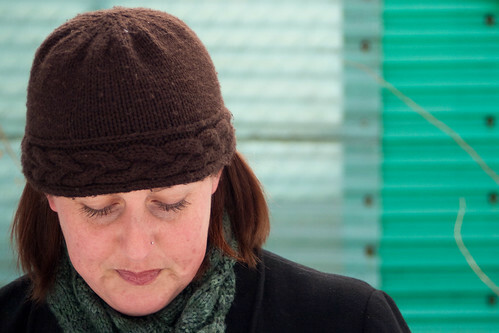 After the last post someone asked how I was alternating between the two ends of the skein. 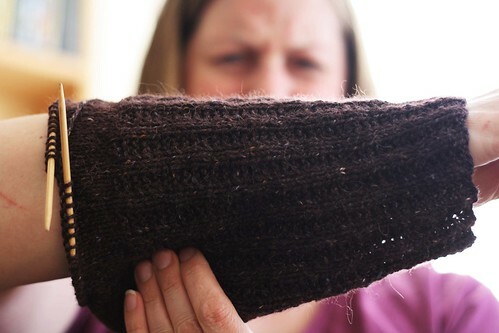 All I'm doing is carrying the yarn up when it's time to switch every 5 rows. 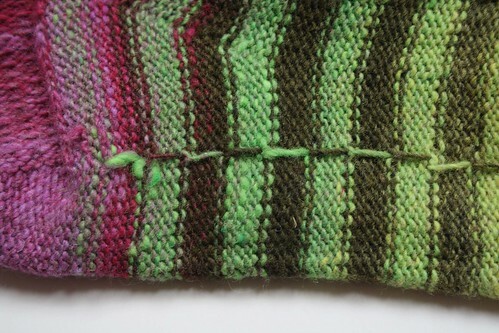 I'm a bit lazy when it comes to colour changes too; I simply wrap the two strands together as one for the first stitch and then drop the old yarn. 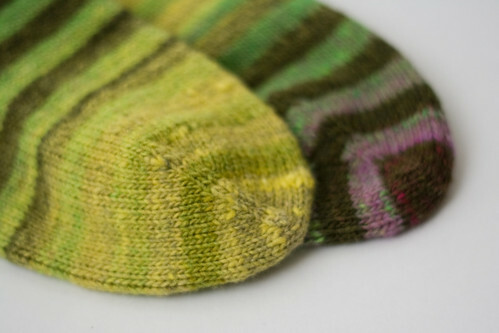 I did the colour changes directly down the back of the leg until the heel. For the foot I moved it over to the side so I won't have to walk on the line of extra yarn. Easy! 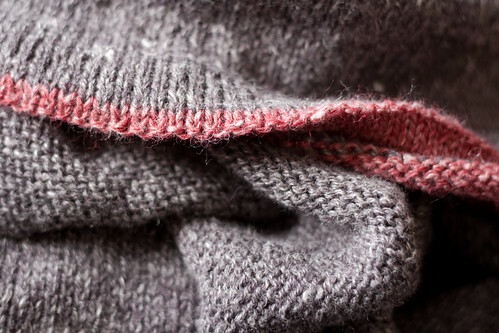 It feels like forever since I've posted about knitting. 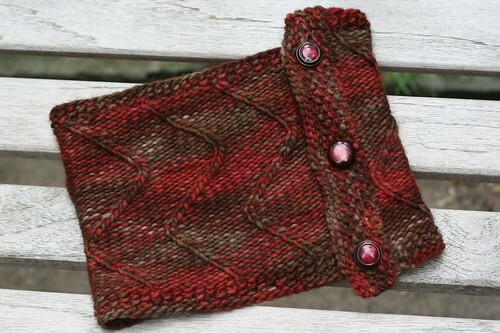 After ripping out and reknitting the first sleeve cuff for Tangled Yoke three times (yes! Three! 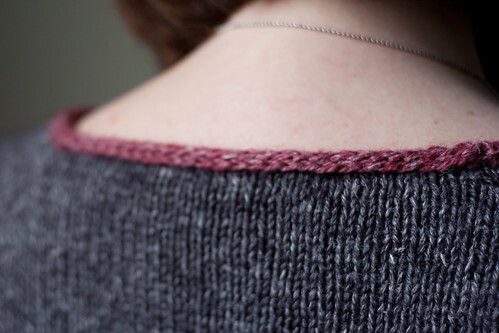 I don't want to face up to what may be a greater gauge issue) I just haven't been super motivated to knit. It's hot, it's summer and I haven't been really excited to cast on for anything. 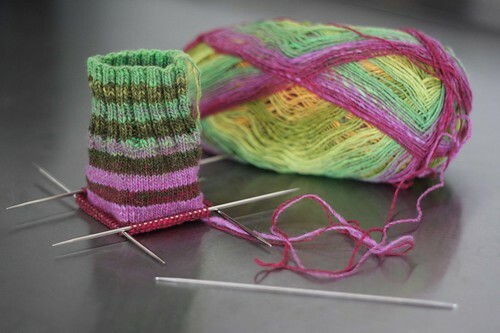 Then last week while knitting with the girls, Cheryl was working on a Noro sock. 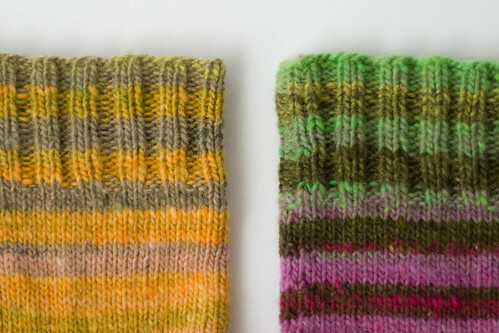 She's using two skeins of Noro Sock yarn and holy smokes did it ever sing to me. 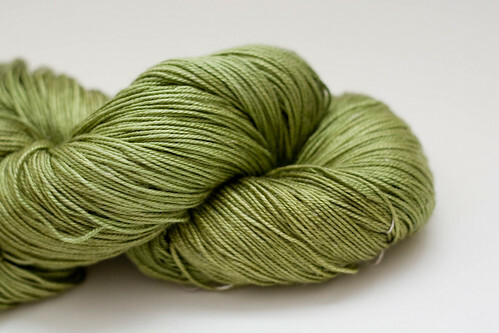 I had one skein in the stash that I bought at my first WEBS trip, so this week at knitting I cast on. 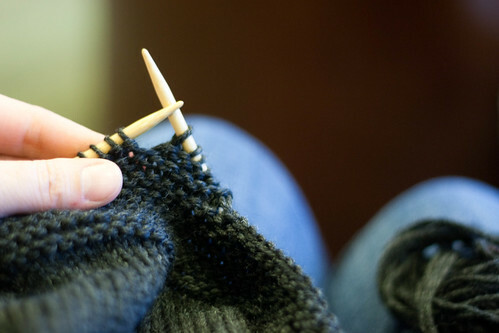 I'm knitting from both ends of the skein and alternating every 5 rows. Exactly the motivation I needed. Colours, stripes, yarn changes and it's not a giant wool sweater sitting in my lap. Sweeeeeet! I had the good fortune of going to Philadelphia a couple weekends ago to hang with an amazing crew of women that I've known online for ages. Some I knew better than others, but safe to say that they're all much much closer now. 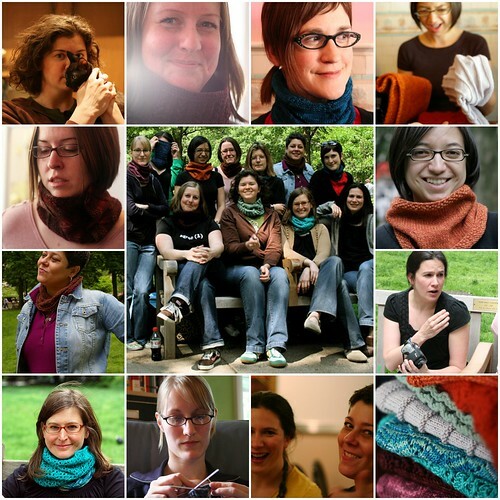 We knit, joked, laughed, snarked and gossiped our way through 3 days. I sincerely wish I'd had the gumption to organize something like this myself a lot sooner. Note to self: don't wait for someone else, just do it yourself. It's well worth it. 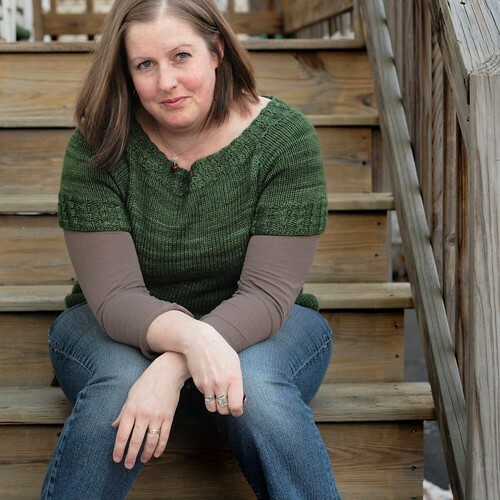 Part of the fun heading in to the Philly weekend was a cowl swap suggested by Ashley (she's a smartie, that one. Wait til you see the one she made for me.) With a few weeks notice, I figured it was the perfect sized project to jump in and design my own. 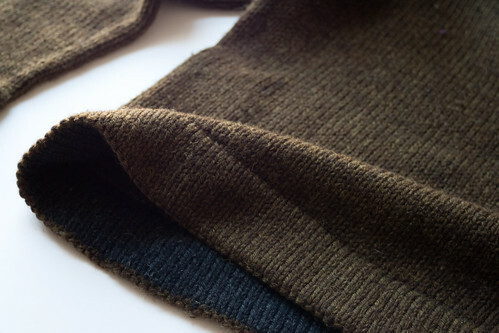 It's a cowl, so size isn't critical and no better way to knit up one skein of something yummy. Behold! 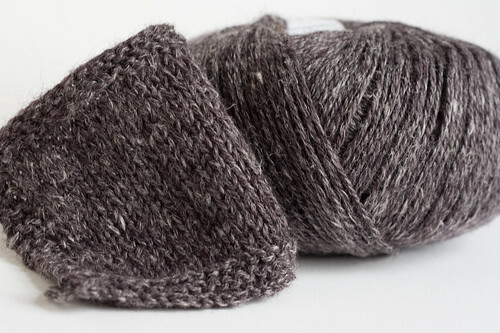 The Philly Cowl in Malabrigo Worsted (in Stonechat.) 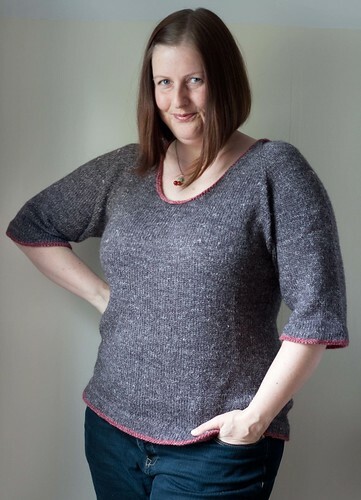 Full details over on Rav where the pattern is now available as a free pdf download. Christy has the original. 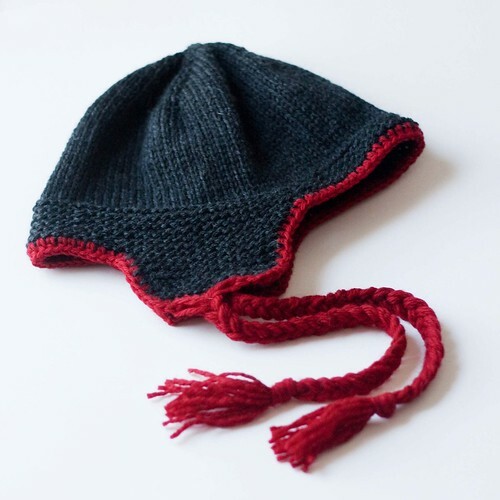 I'm currently finishing up a smaller one with the leftovers of the skein. 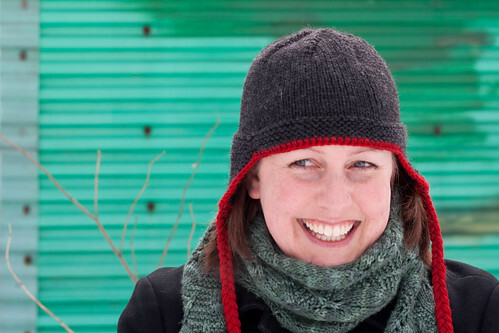 And dig, the Queen of Cowls herself knit one too! 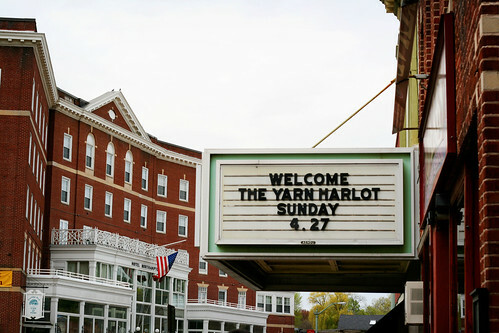 I always have the best time at Yarn Harlot book signings. 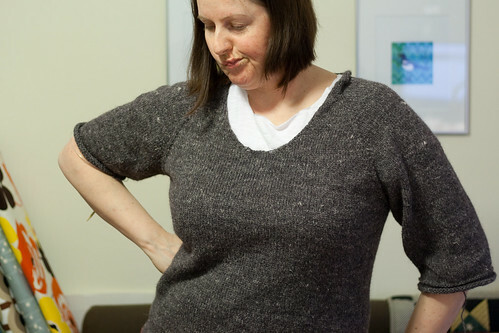 It's wonderful to be surrounded by like-minded knitters in such a positive environment. 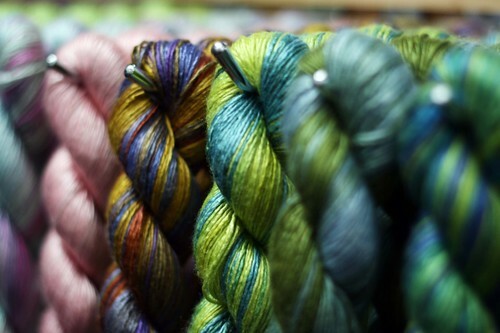 I come home exhausted but happy, my pocketbook lightened and new yarn in hand. 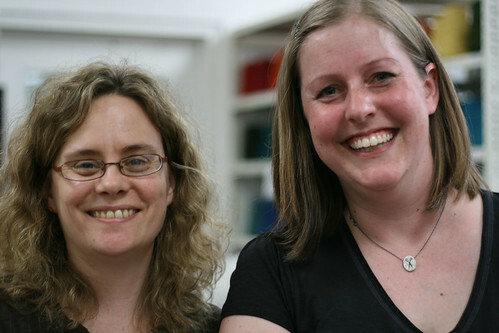 Mum and I made the trek out to Northampton with Jess, Maryse, Kellee, Stitchy and Ms. Melanie. Those girls are made of good times. I'm fairly sure that we could have stood around in the parking lot talking for HOURS afterwards. And really, we kinda did. 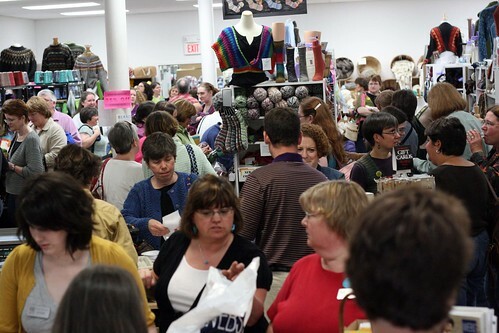 The event was flawless, WEBS was packed and well organized and much yarn was bought. Whew! When do we get to do it again? The body of the Tangled Yoke is finished. I confess I haven't put much effort into it lately. 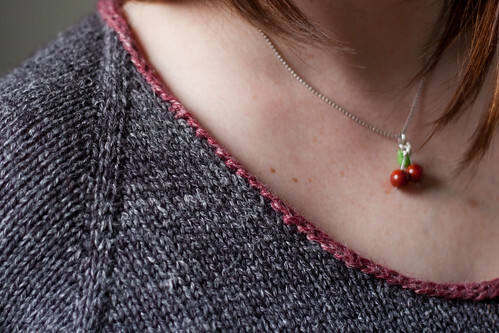 Spring is in the air and I've been busy at the sewing machine instead. 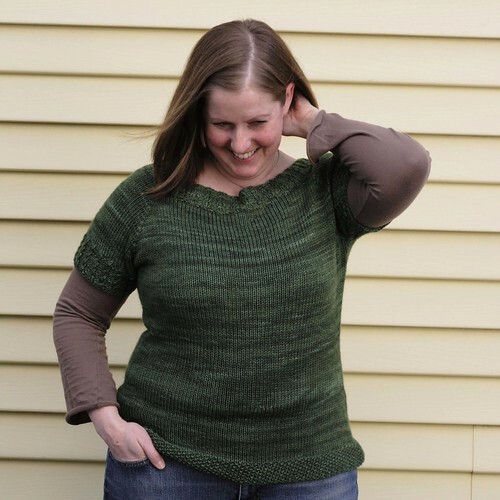 The only time I've worked on the sweater is at knit night and on Saturday afternoons watching marathon sessions of Deadwood on DVD. 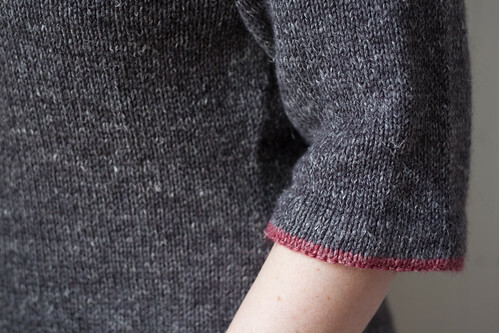 I cast on for the first sleeve this weekend and despite a niggling feeling, kept knitting. It just seemed so big. 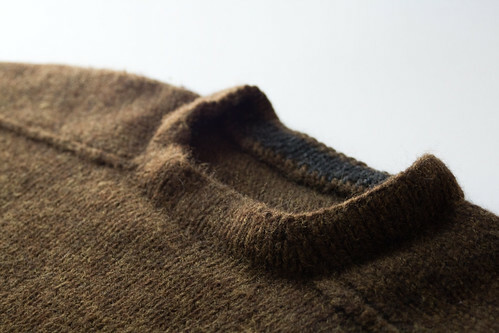 By the time I finished the ribbing and started into the stockinette portion it was confirmed. It's a gauntlet. Hawks can swoop in and land on my wrist kinda big. Mum is flying into town this afternoon so I'll try it on her then, but my suspicion is that it'll be frogged before I go to bed tonight. Sigh. I had really hoped I could make a push and finish it to have Mum model it and take it home with her, but I think I have to frog that idea too. 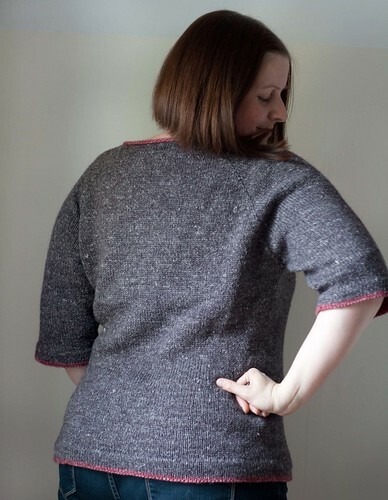 Garter rib is not my favourite rib. 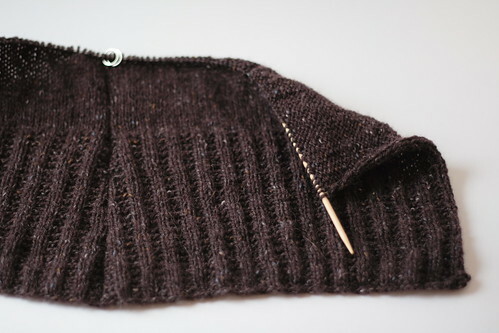 Even though you work the actual ribbing every other row, it always seems to take longer than a plain ol' two by two. I feel like I'm always double checking my work. 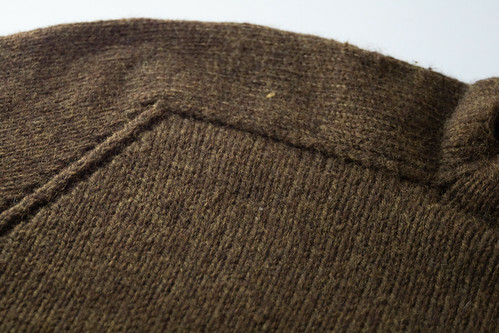 I can't zone out as much as with a regular rib or like with stockinette. I don't know if it's just the way my mind works or what, but it drives me a little batty. Thankfully I have the worst of it behind me now. 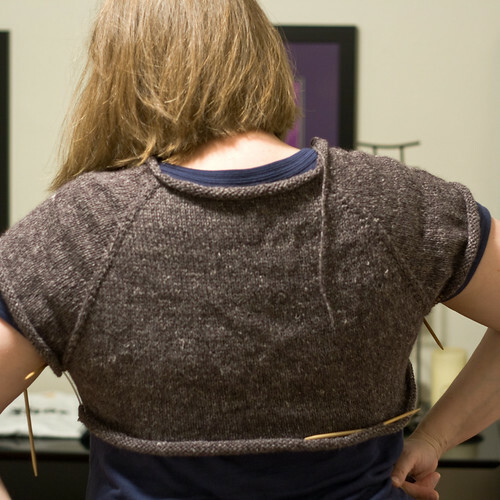 The body for Tangled Yoke is worked as one piece so the only ribs I have left to think about are the sleeves and they're still a ways away.